The Chicago Cello Society was formed in 1980 on the urging of Master Cellist and teacher Janos Starker. Drawing from a cross-section of cellists in the Chicago area, the Society’s members have included members of the Chicago Symphony, Lyric Opera Orchestra, Grant Park Symphony, leading free–lancers and teachers, as well as many semi–professionals and amateurs. Since that time, we have worked hard to fulfill our goals: to promote the art of cello playing; to promote an interest in and appreciation of the cello as a solo instrument; to develop a broader understanding of the art of the cello; to provide performance opportunities for cellists; to provide a common meeting ground for professional and amateur cellists; and to keep abreast of current events in the cello world. For a small organization, we have had quite a few events over the past 25 years. In 1981, we sponsored our first Masterclass for cellists, given by Channing Robbins, professor of cello at the Juilliard School in New York. We also sponsored our first Competition for Young Cellists. Winners received cash prizes, and our first prize winner received a cello bow, presented by Bein and Fushi, Inc., and an appearance on the Dame Myra Hess Memorial Concert Series–broadcast live on WFMT radio. In the summer of 1981, we had our first presentation of “Cellists from the Past” by cellist Gary Stucka from his world–famous collection of old cello recordings. Present at this interesting and informative gathering was an authentic “cellist from the past,” 80-year-old Teddy Ratzer, who had retired from the Chicago Symphony cello section in 1943, and who had personally known and worked with a number of the cellists whose recordings we heard that evening. By the following season, 1981–1982, we were getting pretty well known and started receiving information from other organizations and from a few authors. David Blum, author of Casals and the Art of Interpretation, asked for our mailing list of cellists to send information about his book on the life of the great cellist Pablo Casals to our members. The Emanuel Feuermann Society, Inc., wrote and offered to do a presentation about Mr. Feuermann, possibly the greatest cellist of all time, for our members. In December 1981, we had our first concert of Music for Cello Ensemble. Thirteen cellists participated in this first ever presentation in the Chicago area dedicated totally to the performance of music for cello ensembles. Over one hundred people attended this concert. In March 1982, we sponsored our second Masterclass, given by Zara Nelsova. Six weeks later, we sponsored our third Masterclass, given by Raya Garbousova, world–renowned cellist and teacher. In May, we sponsored our second competition for young cellists. We had such success with our first competition the year before that we opened it up to cellists throughout the country. Our winner that year was from the Juilliard School. The following season, 1982–1983, we started out with the Emanuel Feuermann Memorial Presentation on November 14. Being able to see and hear this great artist was a rare treat and a tremendous educational experience for all the many cellists who attended. An interesting aside was offered by Sam Sciacchitano, an older cellist and member of the Chicago Symphony cello section, who had actually studied with Mr. Feuermann. He was able to add some interesting details about the great master, who had suffered an untimely death in 1942 at the age of 40. In March 1983, we had our second concert of Music for Cello Ensemble. The program included the local premiere of the Kousnetzoff Suite in Five Parts for four cellos, a major work for cello ensemble written by a 19th century professor of cello for himself and 3 of his students. The 1983–1984 season was a very important one for the Chicago Cello Society, starting with becoming a charter member of the American Cello Council. This organization of cello clubs was established to continue the presentation of the American Cello Congresses that had begun two years earlier in Washington, D.C. In March 1984, we began publication of The Cello Scroll, the newsletter of the Chicago Cello Society. Until this newsletter, we had been sending out simple one-page letters announcing our events. This publication gave us a great deal more organizational power and scope. 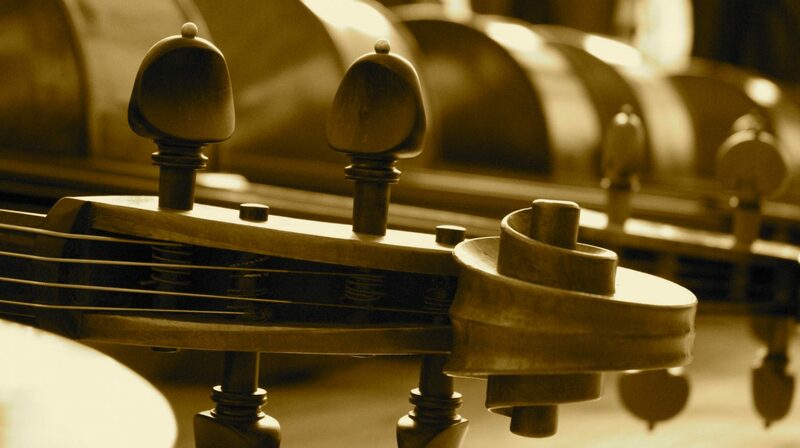 Beginning with this first issue, our public relations director Charlotte Lehnhoff began a series of articles about the cello, its music, history and techniques. These articles are now indexed in the Library of Congress. And our Coming Events page in the first issue consisted of 19 events! In March, we presented our second Masterclass with Zara Nelsova, a class she asked to do because she had enjoyed the first one so much. We also helped in the presentation of a Masterclass with Leonard Rose, another great cello soloist. In April, we presented our third concert of Music for Cello Ensemble. In June, we had our third Competition for young cellists. The 1984–1985 season was another busy one for the Society. We helped with the planning for the 1986 American Cello Congress in Bloomington, IN, and hosted by Janos Starker. (Earlier that year, Mr. Starker played three concertos with the Lake Forest Symphony, an unbelievable feat.) The Cello Scroll began its second year, and we made plans for our first Fall Cello Festival. But it was a year of heartache as well. The newsletter reported on the death of Leonard Rose and the retirement of our Honorary President Frank Miller from his position of 25 years as principal cellist of the Chicago Symphony. In February, we presented a Masterclass with Carter Brey, young solo cellist who had just made his solo debut with the Chicago Symphony and now principal cello with the New York Philharmonic. In March, we presented our fourth concert of Music for cello Ensemble, presenting the first local performance of the Villa–Lobos Bachianas Brasilieras No. 1, for eight cellos. We also presented Mary Springfels, world–renowned baroque cello and viola da gamba specialist in a lecture–demonstration. Charlotte Lehnhoff began her engaging and entertaining series on the History of the Thumb Position in The Cello Scroll. In May, we presented luthier Henning Christiansen in a demonstration on cello making and repairs. In September, 1985, we began the 1985–1986 season with what would probably be considered the highlight of our brief existence: our Fall Cello Festival. Co–sponsored by the Chicago Cello Society and Northwestern University, we presented a 3½ day intensive festival of cellos and cellists. In this short space of time, we presented two seminars (Auditions and Orchestra Performance, and Teaching Techniques); three recitals (Marc Johnson, Ko Iwasaki, and Laurien Laufman); four Masterclasses (Raya Garbousova, Janos Starker and two by Alan Harris); a concert of Cello Ensemble music; a concert by our past Competition winners; a “Cellists from the Past” presentation; and a Cello Ensemble “Jam Session.” We were also the host for the 1985 meeting of the American Cello Council Board of Directors. Quite a full weekend! The season continued in December with a concert of the six Bach Cello Suites, performed by six different cellists in the perfect setting of St. Luke’s Church in Evanston in honor of Johann Sebastian Bach’s 300th birthday. Unfortunately, we also had to report on the deaths of Frank Miller, Pierre Fournier, Mischa Schneider, Jascha Bernstein and Fortunato Arico. We continued the year with our fourth Competition for Young Cellists. The first prize included an appearance as a finalist in the Jill Sackler Cello Competition sponsored by the Third American Cello Congress, $500 cash, a cello bow donated by Bein and Fushi and a concert on the Dame Myra Hess Series. Our first prize winner, Eric Kim, went on to win co–first prize at the Sackler Competition. The season concluded with the Third American Cello Congress in Bloomington. It was a wonderful gathering of over 500 cellists. 1986–1987 saw the appointment of John Sharp as Principal Cellist of the Chicago Symphony and his appointment to the Board of Directors of the Cello Society. December 15, 1987, had a sequel to the highly successful all Bach Suite concert of the year before: a performance of all five Beethoven Sonatas. The performers included four members of the Chicago Symphony–including the new principal–and the cellist of the Vermeer Quartet; one pianist, Andrea Swan, took on the monumental task of all five performances. This concert seemed even more successful than the one the year before. Meanwhile, plans were beginning to formulate for the first World Cello Congress, planned for June, 1988, Washington, D.C. April featured another “Cellists from the Past” evening, hosted by cellist Gary Stucka, who had recently left the Cleveland Orchestra to join the Chicago Symphony. A new feature, inspired by the “Cellists from the Past” idea, was added to The Cello Scroll: “Notes from the Past,” a column devoted to news items about cellists taken from string magazines and books from the last 40 years. In August, the Cello Society, in cooperation with the Ravinia Festival, was able to offer free of charge tickets to hear the young cellist, Andres Diaz, winner of the 1986 Naumburg Competition, in his debut with the Chicago Symphony. As in previous years, the 1987–1988 season had some happy moments and some sad ones. The Cello Scroll began with a fascinating article by Emanuel Feuermann, written one year before his untimely death, and a penetrating article by Charlotte Lehnhoff about the Beethoven A Major Sonata. We presented our fifth concert of Music for Cello ensemble in December, and also presented a clinic on the use of the cello ensemble in the school music program at the Midwest Band and Orchestra Clinic, held in Chicago. Presented for the first time on these two ensemble concerts was the High School Cello Choir from the Music Center of the North Shore. Unfortunately, our second issue of the year–our biggest ever–included the sad story of the death of Jacqueline du Pré, the great cellist who was stricken with Multiple Sclerosis at the height of her career in 1972. The newsletter also took on a new look, thanks to the new Macintosh computer acquired through an anonymous grant. The graphics were wonderful! The hope was also that we would be able to write our own arrangements for cello ensembles using this wonderful machine. In May, we presented our third concert of cello sonatas featuring different local cellists. This one was devoted to the romantic sonata repertoire for the cello. Once again our pianist, Andrea Swan, tackled all four difficult piano parts. Our fifth Competition for young cellists took place in June 1988. The first winner, Wendy Warner, still in high school, appeared at the first Masterclass given by Zara Nelsova for the Chicago Cello Society back in 1982 when she was only 11 years old! The season ended with the first World Cello Congress in Washington, D.C., held in June 1988. The 1988–1989 season began early when in July we sponsored a lecture-demonstration by Baroque cello specialist Anner Bylsma. Bein and Fushi, donor of the bow for our first prize in our competition, co–sponsored and hosted this wonderful event. In August, we had another presentation of “Cellists from the Past” presented by Gary Stucka, this time including some fascinating video presentations. In November, 1988, we presented our third Masterclass with Zara Nelsova, this time co–sponsored with the Civic Orchestra of Chicago. The Cello Scroll, in its sixth year, continued Charlotte Lehnhoff’s investigation of the Beethoven A Major Sonata and began reprinting a series of articles from 1899 from The Strad magazine on the literature of the cello. In May 1989, the Chicago Symphony cello section, most of whom were members of the Chicago Cello Society, gave the first Chicago Symphony performance of the Villa–Lobos Bachianas Brasileiras No. 1 (which the Cello Society had given the local premiere several years earlier). We were also saddened by the death of our member, Kathleen Francheschi, who died at the age of 41. She left a grant for the Chicago Cello Society in her will, and we will be using it to help continue our Scholarship Competition. During the 1989–1990 season, The Cello Scroll, widely acclaimed as one of the foremost cello newsletters in the country, continued its investigation of the literature of the cello from 1899 and the Beethoven A Major Sonata. In March 1990, we sponsored Cello Day, featuring panel discussions on the Careers of the Cellist and the Orchestral Repertoire, and (probably for the first time ever anywhere) a performance of the complete 40 Popper Etudes for Cello (known as the High School of Cello Playing and widely considered the most important cello etudes) by 20 Chicago Cello Society cellists. It was truly an event to remember. We sponsored a Masterclass by Lazlo Varga in November 1991 and one by Janos Starker in May 1992. There was an in-house concert at the home of Larry and Abby Block in December 1991. We had our 2nd Fall Cello Festival in September 1993, which included another Competition for Young Cellists. We held another Bach Day in March 1995 (this time with dancing)! In May of that year, we sponsored an exhibition of the fabulous bow collection of Shirley Miller, combined with a bow-making demonstration by Doug Raguse. In May, 1996, we had a demonstration on caring for your cello by Ken Stein. Our long range goals include setting up a scholarship to pay for a year’s worth of lessons for two to three young local cellists. We would also like to see the airlines allow cellists to carry their instruments on the plane, when there are extra seats available, at no charge. We will be continuing our Masterclasses, concert performances and competitions as well.